So, now that I am re-inspired, what do I cook? I thought about it last night, and I knew that some beloved people were coming over for a spot of watching BBC’s Sherlock. We needed some good, hearty hungry people food. 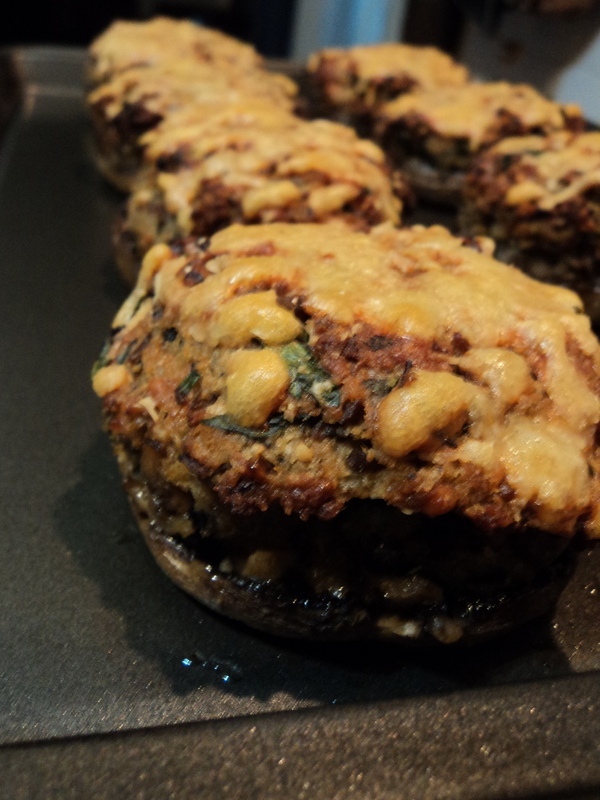 And I remembered… one of the first things I ever “made up” inside my head were these stuffed mushrooms. A little twee, I know, and very, very retro. However, classic dishes never ever go out of style, and at the time I first created these, I was on a second hand cookbook kick, and reading books from the 50’s and 60’s – jellied avocado salad and things like that. The section in these old school cookbooks that really tweaked my interest was the hors d’oeuvres – wonderful things like puff pastry cheese twists, sour cream onion dip, and mushrooms in just about every form possible. Mushrooms on toast, pickled mushrooms, grilled mushrooms, mushroom jellies. And of course, stuffed mushrooms. Stuffed with everything from spinach to simple breadcrumbs. I have to say here, I adore mushrooms. I think they are fantastic, delicious, easy and incredibly varied. Mushrooms are definitely amongst my favourite things to eat in the world. And I love love love this recipe because it, like mushrooms, is so infinitely adaptable. Stuffed mushrooms are also fantastic as part of a feast or larger spread – they would be great as a side dish, or the stuffing part of a vegetarian Thanksgiving or Christmas or New Years – or any other big celebratory party. They can be made in advance, held up to 2 days in the fridge, and brought to room temperature to serve. You could even warm them up a bit in the oven if you like. The stuffing must be cooked before refrigerating though because it has raw egg in it – and raw egg mixed with bread and mushrooms and other good things, sitting in the fridge, is a bad accident waiting to happen. To be honest, I usually prep the mushrooms, saute the duxelles, and refrigerate that and prepare fresh on the day. Otherwise, I would be way too tempted to eat them all up before the party! They are that good. And leftovers (if youre lucky) make a sublime breakfast, cold from the fridge even, the next day. First comes the preparation of the mushrooms, and you really need to focus here. Examine all your mushrooms, and put aside your favourite eight. These will be the mushroom caps that will be stuffed. Peel and finely chop the remaining four mushrooms and stems. Place finely chopped mushrooms in a large bowl. Peel your remaining eight mushrooms and stem them. Chop the stems finely and add to the bowl. Slice a thin slice off the top of the mushroom so that it will lay flat on the baking pan. Using a melon baller, scoop out as much mushroom flesh from the interior of the mushroom as you wish. With Swiss browns this tends to be quite a lot. Finely dice the scooped and sliced flesh. Place the scooped out mushroom caps in a small bowl, cover with a cloth and set aside. You should have about 5 – 6 cups of diced mushrooms. Take a large non-stick frying pan, over medium high heat, and warm the olive and truffle oils. Saute the garlic lightly until it just softens. Add the diced mushrooms in three lots of about 2 cups each. You dont want to crowd the mushrooms in the pan – otherwise they will begin to steam, and wont saute well. Add one lot of mushrooms, and stir well, coating the mushrooms with the oil and garlic. Add salt and pepper, and allow the mushrooms to saute until lightly browned. Only then should you add the second lot of mushrooms. Stir well, add a little more salt and pepper, and allow to saute again. They will begin to let go of some liquid. This is good. Each lot may take up to five minutes or more to cook through. Once the second lot has been sauteed to your liking, add the final lot of diced mushrooms, stir well to combine, and slice the butter thinly over all the mushrooms. Allow the heat of the mushrooms to melt the butter – this will flavour the mushrooms, encourage a little sauce to form, and add a bit of oil to the pan. Let the mushrooms cook for a few minutes, and then pour over the balsamic vinegar. Stir well to combine, and then add the cream and Dijon. Stir, taste and adjust salt and pepper. You should have a pile of gorgeously sauteed mushrooms, with a little bit of thick mushroomy sauce. Take the pan off the heat and transfer the mushrooms back to the large bowl. You should have about 2 – 3 cups of cooked duxelles. Stir the mushrooms well and add the breadcrumbs immediately. Stir well, and allow the breadcrumbs to soak up all the wonderful mushroom juices. Add the parmesan and stir well again. Taste and adjust for seasoning. Mince your herbs of choice very fine, and add to the bowl, mix to combine. Whisk together the eggs and a further tablespoon or two of heavy cream. Pour this mixture over the mushrooms and stir lightly to create a stuffing. You really dont want to make a dense stuffing – just use the eggs and cream as a binder to get everything nice and cohesive. If you want to add anything else (a bit of spinach, some roasted peppers, a few shards of sun dried tomatoes), you can do so now. Set the stuffing aside for a moment while you prepare the mushroom caps. Preheat the oven to 200C (400F). Prepare a large baking sheet by lining it with parchment paper. Take the mushroom caps, and pour a teaspoon or so of olive oil into your hands. Using your hands, rub each mushroom cap well, and place it on the baking sheet. This will ensure the mushroom caps bake through and dont dry out in the heat of the oven. You may need to add a bit more oil to your hands to really oil all eight mushroom caps. Still using your hands, divide the stuffing between the eight prepared mushroom caps. Dont over stuff, and dont let the stuffing overflow too much. As the mushrooms bake, the caps will shrink, and the stuffing will fluff up – you dont want a huge difference between the two in the end product! Grate a bit of parmesan and sprinkle over the stuffing – I used about half a cup in total. Bake the mushrooms in the hot oven for about 25 to 30 minutes, rotating the baking pan about 15 minutes into the baking. Allow the mushrooms to cool down a little bit once removed from the oven, or serve at room temperature.